ONLYOFFICE is an open source solution that comprises comprehensive online document editors for text documents, spreadsheets and presentations with multiple productivity tools: CRM and project management, mail, calendar, chat, and more. ONLYOFFICE Community Server is the collaborative open source system distributed under GNU GPL v3.0. Twilio is a cloud communications platform for building SMS, voice and messaging applications using web service APIs. 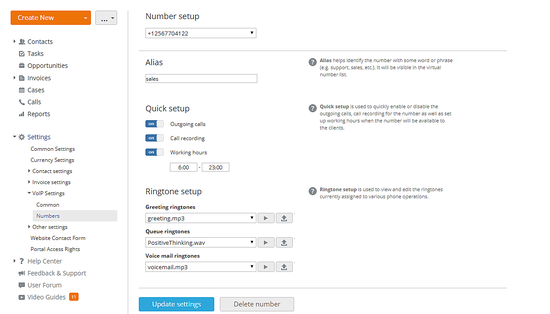 If you need to make work calls often, enable VoIP in ONLYOFFICE using Twilio integration. This feature allows you to receive incoming calls and make outgoing calls right from a web browser using virtual numbers. Update ONLYOFFICE Community Server to the latest version using Docker following this tutorial. If you're new to ONLYOFFICE, get the latest version from GitHub. Sign up to Twilio or log in to your account if you already have one. Copy your API credentials - ACCOUNT SID and AUTH TOKEN, that can be found in the 'Account Summary' section. Enter ONLYOFFICE and go to the Settings page. Then, select the Integration option and open the Third Party Services section. Find Twilio in the list of third-party services and click the switcher next to its icon. Paste Account SID and Auth token to the corresponding fields and click the Enable button to save settings. Please note, the ability to connect a Twilio account is available for portal administrators only. 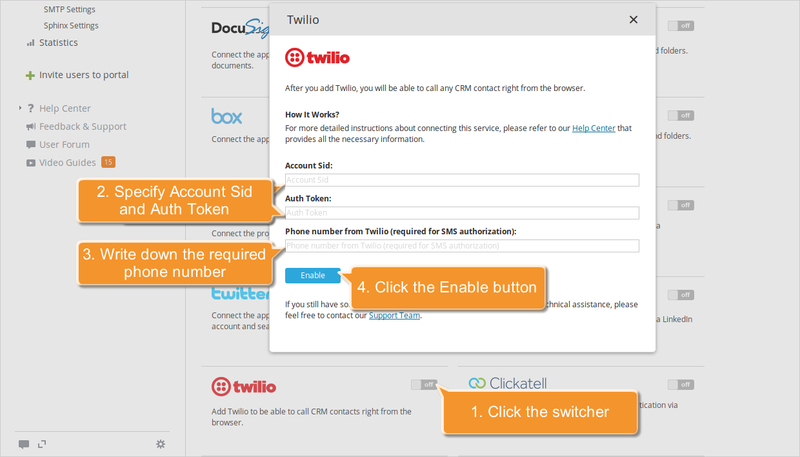 Once your Twilio account is connected to ONLYOFFICE, you are able to add virtual numbers. Go to the CRM module and open the Settings section. Select the VoIP Settings option and click the Buy phone number link. 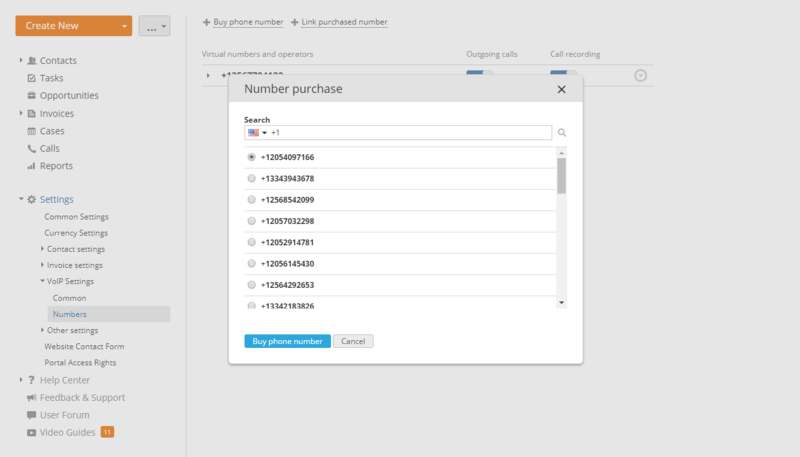 In the Number purchase window, select the needed number from the list of the available ones and click the Buy phone number button. Use the Link purchased number option if you already have some numbers purchased earlier in your Twilio account. 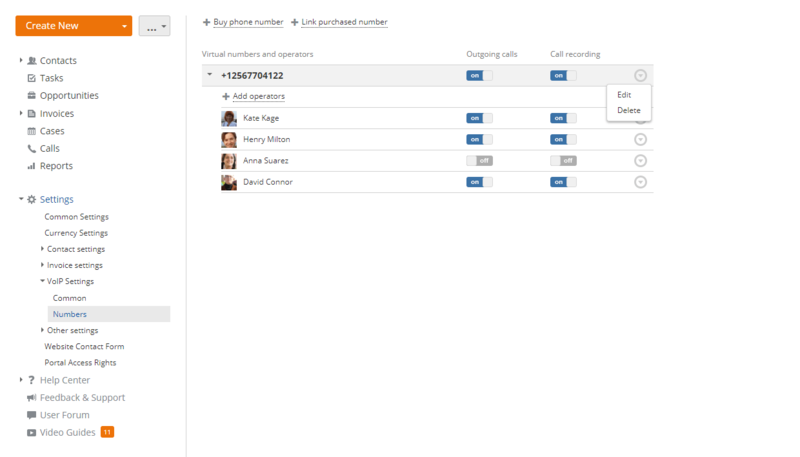 In the Virtual numbers and operators list, select the number you are'going to manage. Click the Outgoing calls switcher to be able to make outgoing calls. 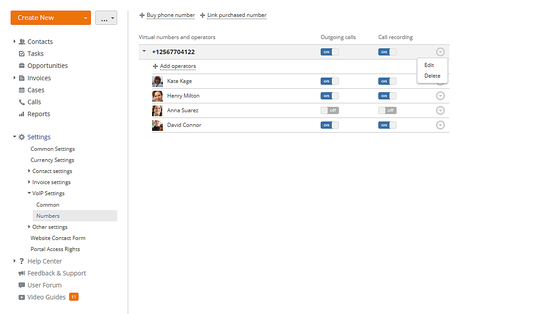 Click the Call recording switcher to be able to record all incoming and outgoing calls for the selected number. Click the arrow to the left of the number to add operators who should be able to use this virtual number. Click the Update settings button to apply the changes.